cilantro, fresh homemade salsa, Julia Child and cilantro, peach salsa, Pico de Gallo Fajitas, Recipes, salsa, Simply in Season, Whatever Happened to Dinner? Fresh homemade salsa! Salsa is one of those things that does not taste at all like the cooked or canned store variety. I like the canned store variety o.k., but fresh—it feels like a vegetable dish instead of just a condiment. But the question is cilantro. Do you like it or not? Is your salsa not salsa unless it has cilantro? Fresh basil? How hot is too hot? Or not hot enough? These were all questions I stared down as I made a batch to take to our monthly themed potluck lunch at work, the “Summer Vegetable” bonanza. The first time I remember having cilantro where I knew what it was, was in Pico de Gallo Fajitas, with grilled chicken breast/tenders, marinated in juice of limes, cilantro, olive oil, minced garlic and salt and pepper. Wayne Gehman, husband of Carmen Wyse (one of the food editors/recipe testers for my book/cookbook Whatever Happened to Dinner) made Pico de Gallo Fajitas years ago for a similar office potluck event. I fell in love with that sauce and cilantro. So I tried to duplicate the dish for my family a couple weeks later. They liked the chicken but not the cilantro taste peeking through. Huh? Who were these morons, I wondered, not to like all that deliciousness. When I learned that the taste for cilantro is somewhat genetic and that even great chef Julia Child picked cilantro out of any dish, I didn’t feel so bad about my family’s first reaction. Several of them love it now. If you wondered if salsa and pico de gallo is basically the same thing, Kitchen Savvy does a decent job of plumbing out the differences. 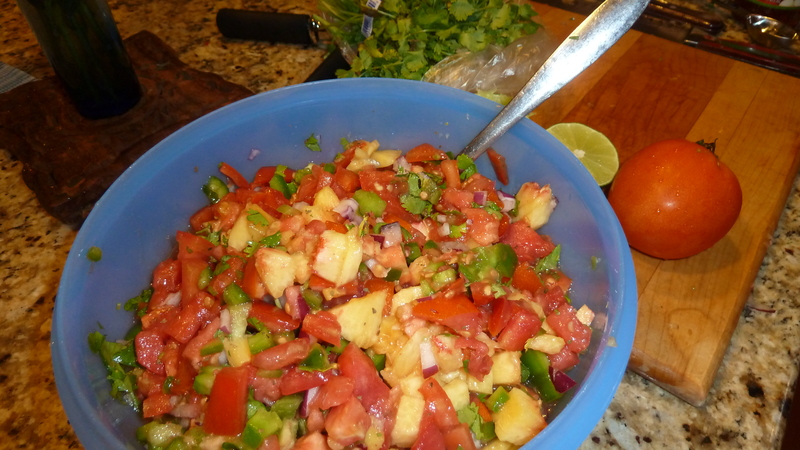 Fresh Summer Salsa – adapted from Simply in Season, Herald Press. Combine in bowl. Let stand 30 minutes and serve. 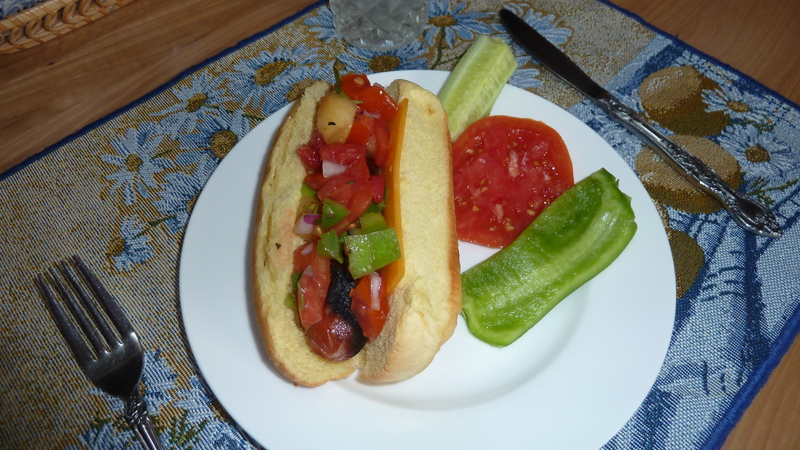 I think fresh salsa is my new favorite condiment for grilled hotdogs. Does that make hot dogs healthy? This salsa also makes a decent topping for garlic bread toasted and applied as in bruschetta, and you could certainly sprinkle shredded mozarella on top. Jennifer, over at Mama’s Minutia blog just yesterday posted a bruschetta recipe, (for which the tomato part is a lot like a salsa) which had her and her family (at least some of them?) swooning. Her pictures are to swoon over, too. I give you permission to go there now. Are you a cilantro lover or hater? Or have you learned to accommodate it? How? Carmen also has a recipe for a mango salsa, plus their original concoction for a huge batch of canned salsa in Whatever Happened to Dinner. 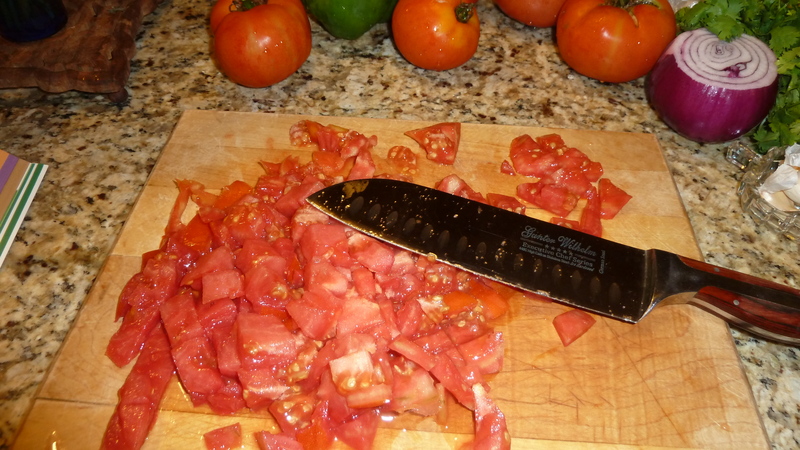 If you have a lot of tomatoes to use up, this might be the ticket (makes 14 quarts). I can send you a free copy of the canned salsa recipe by email. Let me know! Hi Melodie, I am one of those, probably relatively few, that find cilantro very distasteful! Did not have it until about 1995, in salsa, but knew there was something about it I did not like. There is a genetic basis for whether the taste is ok or not – I do not know the details of that trait. Taste is often also affected by other genetic factors. We used to let people taste a piece of paper impregnated with a certain chemical. They could either taste it or not. That was genetic too, and those who could taste it (bitter ) were designated Tasters., others Non-tasters! Interesting variations in a class of students. So cilantro is not for me – at all! Typically I don’t like cilantro. The taste is a little too piquant for my palate, but I do like it in salsa, which usually is an accompaniment to something milder. However, your hotdog dish does look appetizing, Melodie. You always pick great words for your comments. It is interesting to hear from non and cilantro-loving folks alike: glad to know my family members have company! I love cilantro…when I have a recipe made by someone who doesn’t like cilantro so they leave it out…just seems flat to me. I know for sure my mother and grandma’s and my mother in law did not use it. To double check, I was talking with my mother earlier, after I first read this post, and asked her if she liked cilantro. What was that? She did not know. I’ve been growing it myself the last 5-6 summers. We like adding it to Mexican, Thai, Indian, Hmong recipes. I have become a big fan in the last years. All of the above (cuisines) sound good! I’m not sure my mother knows what cilantro is, either. I ‘ll have to ask. I know her well enough to imagine her reaction! I’ll let you know!